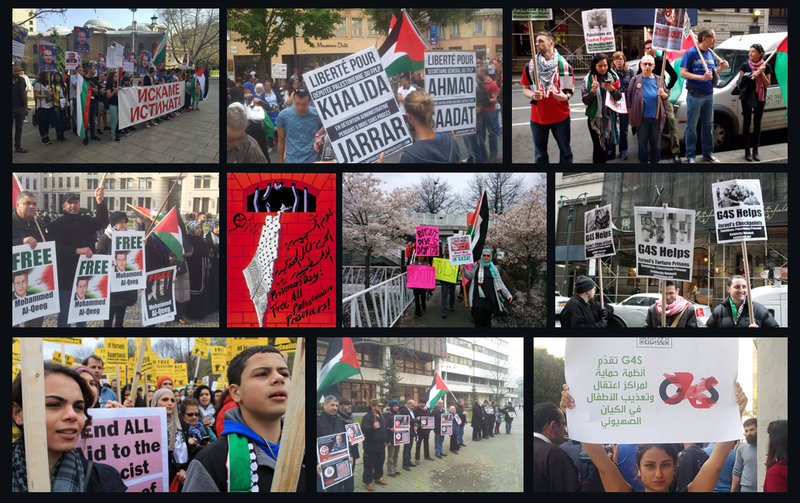 Samidoun Palestinian Prisoner Solidarity Network joined with dozens of groups and organizations in New York City – and millions of people around the world – in participation in the Al-Quds Day (Jerusalem Day) protest and related events on Friday, 1 July. Hundreds of people joined in the central rally at Times Square despite several bursts of driving rain as speakers and participants called for freedom and justice for Palestine. Signs urging the freedom of Palestinian political prisoners – including Palestinian hunger striker Bilal Kayed, on strike since 15 June against his administrative detention without charge or trial – were prominent in the crowd. An announced counter-rally by the ultra-right, violent “Jewish Defense League” – allegedly responsible for the assassination of Palestinian American leader Alex Odeh in 1985, as well as violent attacks on protesters and activists in France, Toronto and elsewhere – fizzled, as the large rally in support of Palestine greatly outnumbered the small pro-apartheid group. The International Day of Al-Quds is organized annually in New York by the Al Quds Committee in solidarity with Palestinians. This year the protest focused broadly on supporting the Palestinian struggle, but also on protesting a recent executive order by New York Governor Andrew Cuomo targeting the Boycott, Divestment and Sanctions (BDS) movement. The protest was followed by an Al-Quds Day Iftar, organized by New York City Students for Justice in Palestine, where participants broke the Ramadan fast with food, music, discussion, and educational presentations.